Our Avocado Refined Oil is extracted from the fleshy pulp of the avocado, which is cold pressed and then refined to leave a pale and odorless oil. Like the fruit it’s derived from, avocado oil is high in essential fatty acids and fat soluble vitamins, which makes it an emollient and highly penetrating oil. After refining, avocado oil is a beautiful, clear, and golden oil. The content of Vitamins A and E promote natural collagen production and work in synergy to improve the skin’s tone and texture. Avocado Carrier Oil also contains Vitamins B1, B2, D, and Beta carotene. You can use this oil as 100% of your carrier oil but we suggest that you use between 10-50% at most. Small amounts (5-10%) of Avocado Oil may be added to other carrier oils in order to enrich protein and vitamin content. Odd twist: If you’re allergic to latex, you may also have problems with avocado oil. 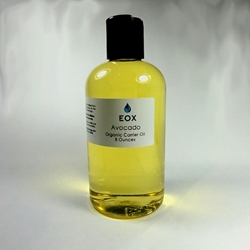 It is recommended to do a small patch test before applying avocado oil.